There are two primary factors in the future of the Macintosh: macOS as a software platform, and Mac hardware. Apple has been relentless in updating macOS software. It has issued a dozen major new versions over the past sixteen years, roughly twice as many major new releases as Microsoft's Windows over the same period. Apple's latest macOS 10.12 Sierra release officially supports Mac hardware from 2010. More troubling to many Mac users--and potential Mac buyers with specialized needs--is that fact that some of Apple's Mac hardware hasn't been updated for years, creating uncertainty about whether Apple still values some of its smaller niche businesses that were once considered strategically important, including pro audio, video, graphics and publishing. This is particularly the case in the face of the massive adoption of iOS, Apple's Post-PC platform powering iPhone and iPad, which has become the company's primary source of revenue and profits. Where're the updates to existing Macs? Consider Apple's current Compare Mac Models page, which lists a dozen Mac products. Seven of those are notebooks, three are iMacs, and two haven't been materially updated in years: Mac mini and Mac Pro. Last October's Late 2016 MacBook Pro was also considered a delayed refresh; the company's best selling high-end notebooks hadn't been previously updated in more than a year. However, that model got more than just a new speed bump; it involved an entirely new generation of system architecture from its lighter, thinner case to its Wide Color display to its immersive audio, PCIe SSD storage and Thunderbolt 3 connectivity. Apple also still sells its previous generation of MacBook Pros to reach a lower entry price. Beyond those Pro notebooks, Apple also sells its Early 2016 MacBook (with Retina Display) and continues to sell what is effectively the "previous version" of this model: the Early 2015 MacBook Air. Apple no longer sells anything in the category of the former iBook or plastic MacBooks from a decade ago, nor a large screen 17 inch MacBook Pro. Underneath its lowest priced notebook, the $999 13 inch MacBook Air, Apple markets iPad Pro and iPad models. Among its desktop models, Apple sells three main configurations of the Late 2015 iMac, along with the "Late 2014 Mac mini" and the "Late 2013 Mac Pro." The company no longer sells any configuration of Xserve, nor a specialized version of a Mac Pro Server or Mac mini Server. This raises some obvious questions. Why isn't Apple updating its existing models with greater urgency? Why isn't Apple selling higher-end workstations and servers? And, perhaps, why isn't Apple spreading the Mac brand around on Home Servers, Media TV-puters, carputers, stylus driven 2-in-1 convertible notebooks or desktop studio drawing desks? The answer to all of these become clearer when you look at the results of companies that are doing the opposite of Apple. Why isn't Apple updating its existing models with greater urgency? Consider both of Apple's 2016 updates to its notebook line. Both were complete overhauls of its previous lineup. PC makers have been working to copy the MacBook Air in tandem with Intel and its Ultrabook program. Rather than just updating the Air with a Retina Display, Apple created a new kind of ultra light machine, and then issued a new, higher performance category sharing some of the same elements for its MacBook Pro. Both updates leveraged design technology developed for (and paid for by) iPads. What if Apple continuously made minor tweaks so that Mac models were always "new"? The result of these updates was a new surge in Mac sales, stoked by the anticipation and backlog of demand. How would Mac sales have performed if there had been no wait? What if Apple continuously made minor tweaks so that Mac models were always "new"? Most PC makers have long done this, constantly changing their PC components to offer whatever is newest or cheapest, depending on the price category of a specific model. The result is non-cyclical sales. Another result is clearance models related to continuous inventory purges. This trains buyers to wait for sales, rather than for new releases. Apple does do some inventory clearances at the release of new Mac models, typically through partners who offload older models for the company at a discount. But these sales are minimal, intentionally limited by the fact that Apple commonly lets existing inventories deplete before launching a new release. This also focuses attention on what's new, rather than on closeouts of old products. Having a clear, gapped differentiation between its newest MacBook/Pro models and its former, previous generation models still being sold as entry level options also provides for an expanded range of pricing without creating a "tyranny of choice" for buyers faced with a confusing gradient of too many, but only slightly different, options. This is classic Apple and is also apparent in its iPhone and iPad sales. Rival PC and phone makers don't sell one new phone and last year's model; they commonly sell several families of product groups with overlapping features and prices. This isn't just confusing for consumers but is also far more difficult to manage for the manufacturer and their retailers, who have to account for hundreds of SKUs rather than just a few. Again, the result is more excess inventories, more discounting and harder-to-support products. 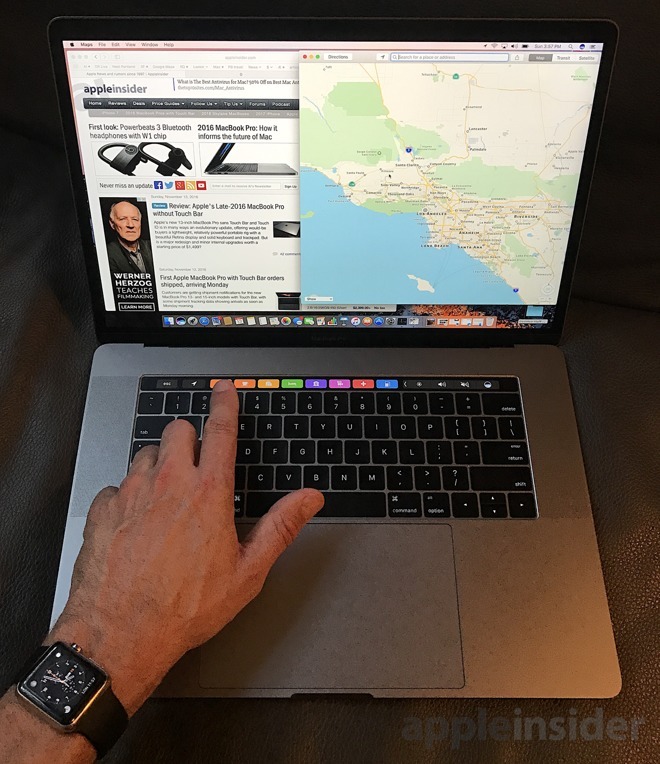 By only updating new models when there's something significant to offer (such as the all new design of last year's Mac notebooks, and the new Touch Bar feature), Apple can sell its new products to a hungry audience that has been waiting to upgrade. And by creating cycles, it can also better manage its inventory levels--still a complex operation, but much simpler than if it had a wider range of offerings updated every quarter. Extended product cycles create anticipation and then set up buyers to feel comfortable investing in a premium product, knowing that it won't be immediately obsolesced by another new release a few months later. The same trend cycle occurs in the automotive and garment industries. The more premium the product is, the more obvious its marketing cycle. In addition, significant product cycles also allow Apple to introduce products with major new features--developed at significant expense--and then focus its marketing on selling the result at a premium in a burst of sales that pays for the invested effort. Commodity hardware makers who continuously update their products rarely introduce major jumps in technology because they can't afford to. In its earnings calls, Apple executives frequently note that new product introductions initially involve higher component costs and therefore lower margins. Over time, component costs can be lowered, resulting in higher profits through the rest of the product cycle. If the cycle is shortened dramatically, the ability to profit from lowering one's own component costs is eliminated. Essentially, if Apple didn't take time to think big, it couldn't ever afford to think big. Another advantage to creating buying cycles is that Apple can (for example) promote sales of Macs in one cycle, then focus on sales of iPad Pros in a different season, rather than always focusing on both. Last winter, Apple focused attention on its new Mac notebooks. It is currently promoting iPad Pro as "better than a computer," leading into its new March iPad introductions. While critics often complain about Apple cyclicality or cynically use it to generate misleading statistics purporting to prove that sales are down compared to the peak of the cycle a year ago, the reality is that Apple has learned to use cycles to efficiently sell technology better than any of its peers. This wasn't always the case. Back in the 1990s, Apple was updating Macs continually just like PC makers, attempting to sell scores of Performa desktops in a variety of configurations, alongside middle range Centra Macs and higher-end Quadras. Buyers were confused, and inventory was a mess. Steve Jobs lead the charge to radically simplify Apple's offerings. Over the last few years, Apple has focused on significant Mac updates that have the power to drive sales. And if they can't drive sales, those models go away the way Xserve did. This is not to say Apple never makes mistakes. Rather, it works to learn from the results of what it does. The Late 2013 release of Mac Pro may have been a mistake. Its design wasn't readily upgradable, but Apple also lacked the sales volumes to warrant regular significant update cycles. If a cycle is too long, the benefits of product cycles described above begin to evaporate. It may have been better for Apple to have designed a system other vendors could upgrade, with room for standard PCIe graphics cards and perhaps even CPU packages. It appears that Apple mistakenly approached the workstation class PC product segment with the same integrated design skills that worked so well for iMac and iPhone. This approach previously failed in designing Xserve, which while expandable didn't address the basics that rack mounted server buyers find important while focusing on features that market doesn't care about (including an easy to use, simple user interface). 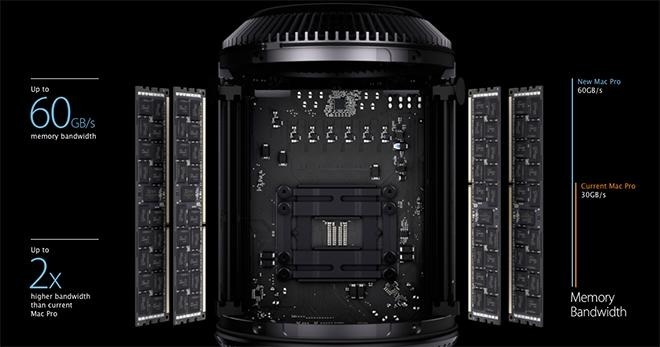 There are some potential ways Apple could rethink its Mac Pro strategy. The simplest change would be to open up its existing design to accommodate third party CPU and GPU processor upgrades. One path to doing this is enabled by Thunderbolt 3, which Apple demonstrated an early affinity for last fall in its design of new MacBook Pros. By enabling third party PCIe enclosures connected with Thunderbolt 3, Apple could address the needs of high-end users of both MacBook Pros and desktop Mac Pro models. The reason why this hasn't happened yet is obvious: Thunderbolt 3 wasn't previously available. Simply updating the existing Mac Pro with Thunderbolt 3 would offer networked benefits for all Pro Mac users, desktop or mobile. However, designing an updated new Mac Pro doesn't change the fact that there is currently very limited demand for Mac desktops. Part of this is related to Apple's constrained strategy for its macOS platform, which focuses entirely on the Mac hardware Apple builds itself. One path to making Mac Pro a more broadly desirable product might be to open up licensing and franchising of Apple's core architecture designs to vendors who can add value and broaden the demand for macOS hardware. Apple could potentially partner with other PC vendors to use its logic boards designs to develop workstations and high-end desktops that run macOS. Apple's last attempt at Mac licensing, starting in 1994, gave other hardware makers specifications for building their own machines that could run the Classic Mac OS. This turned out to be a bad deal for Apple, because it generated lots of new unpaid development work for Apple in exchange for the loss of its own high-end Mac sales, where most of its profits derived from. At the time, Macs weren't standard PCs but rather specialized computer systems that required bespoke support in the Mac operating system. Since the move to Intel in 2006, Macs are essentially a subset of the standard PC architecture. Apple also no longer makes most of its money selling higher-end Mac desktops, making it easier to cede that market to PC partners. Apple already has a robust MFi licensing program related to its iOS product lines. Expanding MFi-style licensing to the high-end niches of macOS could allow third parties to assume the risk in developing those markets. Apple has effectively already done this in IoT with HomeKit. Rather than building its own home automation hardware, Apple has developed (and enforces) specifications so that these third party devices work well with its own platforms. By limiting the terms of its licensing deals, Apple could continue to shape the overall strategy of its macOS platform--creating boundaries for the types of products it would need to assume OS development support for--while expanding the potential reach of its technology outside of the high volume, high margin hardware it currently focuses upon internally. One potential downside is that such a licensing program could turn into a distraction for the company. However, a larger potential problem is that there may not be enough demand for Macs in higher-end markets (such as CAD, biotech and other STEM research). To expand the market for its own Mac Pro hardware (and potentially that of new macOS licensing partners) Apple could aggressively seek out strategic acquisitions to develop a larger base of Pro macOS software. 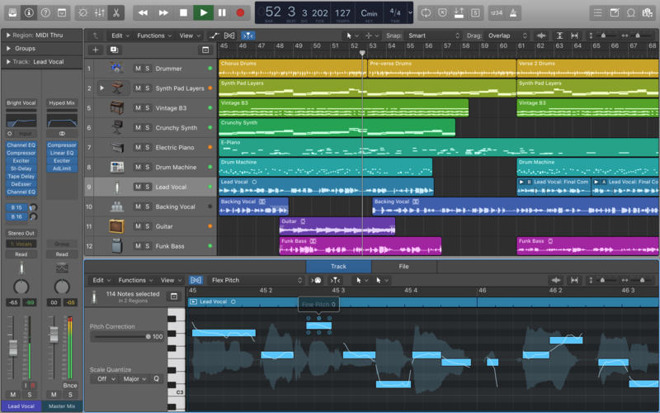 The company previously had success in buying Final Cut Pro and Logic Pro (shown below), building a market for PowerMac hardware nearly two decades ago. While it is currently focused on attacking the entry level Windows PC market with iPad Pro, Apple could surprise Microsoft with an all out assault on Windows in general, assembling a series of high-end PC software titles and making them macOS exclusives. Microsoft itself did this to Unix vendors in previous decades as it worked to create a market for Windows NT in a world where professionals used Unix. Ten years ago, Windows still had an impenetrable monopoly hold on the PC market. Today, Microsoft is desperately trying to find new business in hardware and in cloud services. By creating a subsidiary of Pro Apps and feeding it key acquisitions related to strategic app developers, Apple could go after Windows in two directions: from the bottom with iPad, and from the top with Mac Pro and PC partner macOS licensees. Apple would only need to put a significant ding in a few profitable segments of the Windows PC market to cause serious problems for Microsoft's remaining Windows licensing stream. That would leave Microsoft servicing the least valuable segments of the PC market and greatly increase the size, stature and value of the macOS platform. Microsoft has never been weaker, and Apple has never been stronger. Apple could potentially beat Microsoft by following the company's own "Bill Gates" strategy of buying up specific markets in a series: office workers, then high-end graphics professionals, then video gamers. Of course, Microsoft also ran out of potential returns by spending too much to own businesses of dubious value (such as console video games, with revenues of less than $5 billion annually for Xbox) while losing ground in far more valuable ones (mobile phones and tablets, which generate revenues of more than $150 billion annually for Apple). How much is the PC worth? Thinking about Apple's potential to take territory from Windows while expanding its Mac business also has to take into consideration how little money is left in the desktop PC market. While there are things Apple could potentially do to induce new demand for conventional computers, the reality is that potential demand is finite and it appears we've already run into that boundary. Apple doesn't break down Mac sales by product line or by Desktops and Portables (as it once did, prior to 2013). But we can estimate Apple's annual desktop Mac sales by looking at industry figures for all PCs minus notebooks. Shocker: they are not very big. Data from TrendForce assigned HP 20.7 percent of the 159M unit "notebook market" in 2016. China's Lenovo got 20 percent, Dell 14 percent, Taiwan's Asus 10.7 percent and Apple's Mac 10.3 percent. Note this "notebook market" includes Dell's "robust sales" of Chromebook netbooks (almost exclusively dumped on US schools at very low prices) but not Apple's iOS iPad or iPad Pro sales. 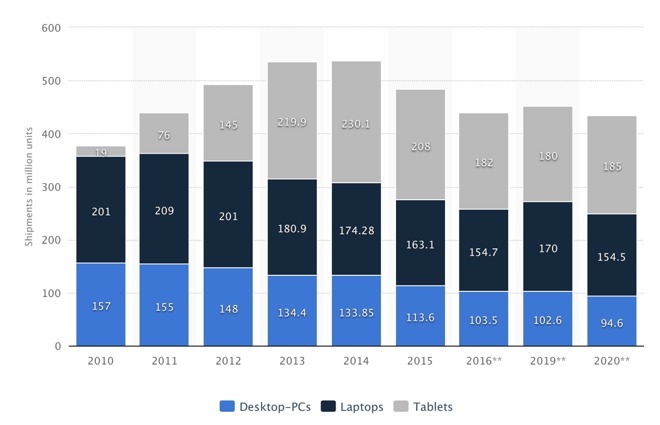 That data is close to the figures reported by Statistica estimating annual, total sales of 154.7M "laptops," 103.5M desktops and 182M tablets in 2016. Note that its sources estimate that little will change in the total numbers of each category through 2020. Figures from IDC report combined notebook and desktop PC sales for calendar 2016 of 260M, a number that is at least in the same ballpark as the slightly different numbers from TrendForce and Statistica. Subtracting TrendForce notebook figures from IDC's total PC indicates that Lenovo, HP and Dell ship the vast majority of desktop PCs (between 23.7M and 18.4M each), and that desktop PCs account for about 39 to 45 percent of their total PC sales. Conversely, Asus and Apple only have about 2 million annual sales of desktop PCs, and those sales only represent 11 percent of their total sales. So when Apple reports selling about 5 million Macs per quarter, that indicates it's selling only about a half million desktops, most of which are iMacs. The remaining Mac Pro and Mac mini sales are pretty small potatoes. In terms of money, HP's Personal Systems (its non-printing business) reported revenues of $29.987 billion in 2016. HP itself reports a revenue split between sales of notebooks ($16.98B), desktops ($9.956B), workstations ($1.870B) and other ($1.18B). So about 61 percent of its unit sales come from notebooks and about 56.6 percent of its revenues did. Total earnings for HP Personal Systems were just $1.15B for the same fiscal 2016 period. Lenovo reported an almost identical $29.6B in annual sales from its "PC and Smart Device Group" (defined as its "core PC business as well as slate tablets, detachables, gaming and other smart devices, excluding smartphones in its Mobile Business Group) for its fiscal 2016. Lenovo is currently reporting quarterly earnings of less than $200M; in its last fiscal year the company lost over $200M. However, Apple is clearly targeting the low end of the PC notebook market with iPad Pro, a strategy that does work because Apple can offer a premium, luxury iPad experience at a price similar to slower, heavier, more complex Windows PC notebooks. Apple reported fiscal 2016 Mac revenues of $22.83B and iPad revenues of $20.63B. Unit sales were 18.5M Macs and 45.6M iPads. So excluding iPads, Apple's total Mac sales generated 76 percent of the revenues of HP or Lenovo, two PC makers that IDC reports as both having three times the "market share" of Apple in terms of PC unit shipments. 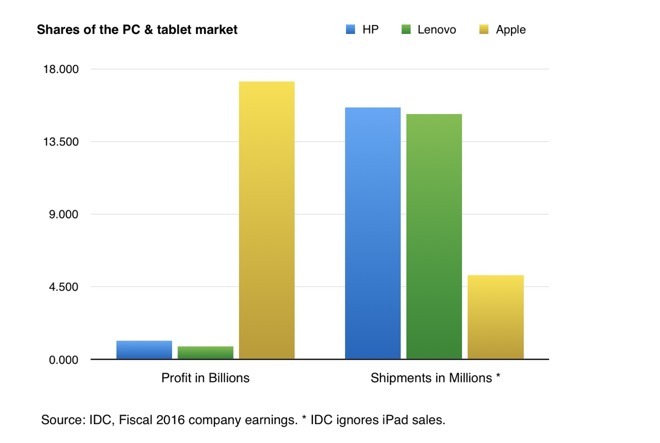 That's not really fair however, because HP and Lenovo PC revenue figures also include their tablet and other sales. Fold in Apple's iPad business and Apple's non-phone computer revenues are $43.46B, over 145 percent of either HP's or Lenovo's comparable revenues, or 73 percent of the revenues of both HP and Lenovo combined. Note that IDC regularly recounts "market share" among global PC vendors based on their estimated unit shipments. This effectively hides the real performance of actual PC vendors. It also distracts from the real collapse in value that is occurring in PCs, which is more evident in Average Selling Prices and product mix than in total unit numbers. Despite selling around twice as many notebooks and about ten times as many desktop PCs as Apple, HP and Lenovo are each only generating about 69 percent of the revenue. Both are also far less profitable. So the question is: could Apple take away their desktop and workstation businesses and expect to make more money from their existing customers, or from other new Mac buyers? IDC market share suggests there are PC units Apple could take. Profits indicate there isn't actually much easy money available. Apple could probably acquire HP outright for around $50 billion (or pay even less just for its PC business). That would allow Apple to claim leading PC "market share," even by IDC's muddy metrics. But this would also result in collapsing margins across Apple's combined PC business. Even if Apple were actually able to take over a very different type of PC maker with a very different business model, and remake its products in its own image (succeeding where Google failed with Motorola), it's certainly not a given that HP's customers would mostly migrate to new HP Macs rather than jump ship to Dell or Lenovo for more Windows PCs. However, if Apple were able to partner with HP (or Dell) to offer macOS PCs targeted to higher-end Mac Pro markets, Apple could leverage the core competencies of those PC makers to support enterprise buyers, entering a market Apple itself hasn't really known how to enter on its own. That could expand the audience of macOS enough be well worth the effort. This would also require the aforementioned Mac Pro Apps strategy of building exclusive support for the macOS platform, in order to ensure that there was enough demand for new macOS PCs for partners to be willing to invest in building them. The third option is what Apple appears to already be doing: incrementally rolling out improvements to the Macs that sell best, in an effort to maximize switching from generic PCs to its own Mac hardware. This strategy is working (albeit slowly), but does not favor users with specific hardware demands that aren't addressed by Apple's current Mac hardware. Working to wage war on Windows and build out a macOS-exclusive software library in order to take over the remaining non-premium segment of the PC market would be very expensive. Another way to spend those efforts would be to invest in computers that are selling in higher volumes and making more money than PCs: mobile devices. That's why Apple has been focused in beating Microsoft and Google (and HP, Lenovo, Dell, Asus and Samsung) in sales of premium mobile devices, where real money is. iPhones are higher margin computers--and far more frequently replaced compared to PCs (which might not be replaced for five years or more). That's also why Apple's primary investments are made in the iOS App Store, where nearly 1 billion users shop, compared to the Mac App Store, which serves a total potential population of closer to 150 million. There's also near-term potential to sell tens of millions of new iOS devices to the new middle class emerging in vast numbers in China, India and elsewhere. The potential to sell new premium priced PCs, particularly higher-end models, is much smaller. Further, new form factors (such as wearables), product categories (such as TV set-top boxes), and device applications (mobile cash registers, retail presentation tools) are not sprouting from conventional desktop PCs, but rather from mobile devices. The technologies powering the next generation of products will be evolutions of smaller and more efficient silicon, sensors, displays and case design, not based on refinements of the Mac desktop or the standard PC box. To survive and remain relevant, Apple should be focused on the future of computing technology, not the future of the Macintosh. 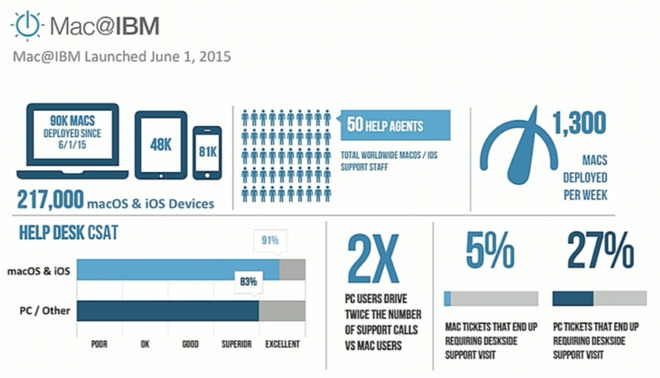 Of course, there continues to be a need for desktop Macs. The power needs of PC users will steadily continue to increase, meaning the processors will need to keep getting more powerful, connectivity will need to keep improving and macOS will continue to need to be updated and hardened. Apple's Mac business is larger than ever. Even if the total market never significantly grows again, just maintaining a replacement cycle for today's installed base of Mac users would be a pretty good business on its own. However, it's harder to see how it could be valuable to invest extraordinary efforts into massively expanding Apple's desktop Mac business. Apple's best opportunity may follow iOS: using IBM's global MobileFirst Swift/iOS consultancy as a way to roll out Macs in the enterprise and among developers. Macs naturally follow iOS. Apple can continually improve its Mac offerings and watch as high satisfaction iOS users migrate from old PCs to either MacBooks or iPad Pros. IBM has noted internal success in migrating Windows PCs to Macs, having deployed nearly 100,000 Macs while rolling out 130,000 iOS devices since 2015. That's also saved IBM a reported $270 per Mac in support costs. At the same time, it's also important to keep in mind that Apple thinks of itself as a creative force for changing the world, not as an expedient accountant capable at incrementally updating the world's existing PCs. That was particularly the case under Steve Jobs. Tim Cook, coming from a background in operations that started at PC maker Compaq, might be reasonably considered more likely to focus on maintaining today's business segments rather than aggressively looking for the next big thing, but even Cook makes it clear that to attract the best talent Apple needs to be more than a basic PC vendor. There may be new technologies that do radically enhance the desktop Mac experience, such as 3D sensors that could drive high horsepower VR FaceTime, or new gaming experiences. But really, market excitement backed up by revenue growth, unit sales, user engagement and profitability has moved to mobile devices. In mobile devices, Apple can drive the industry, shift interaction models, introduce new camera capabilities and host new app ideas that really do change the world. In desktop and notebook PCs, those kinds of changes are far less likely to occur. 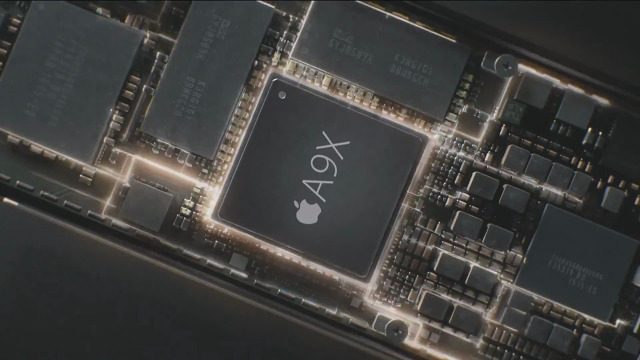 Apple continues to largely follow the PC industry in terms of adopting Intel processors, AMD and Nvidia GPUs, RAM standards and in other components. The most exciting new elements Apple has brought to convention desktop computing have largely been driven by iOS and shared back to the Mac--most recently including Siri, Touch ID, Apple Pay, Messages and the new Touch Bar. There are rumors of further integration of iOS processors coming to Macs to help with battery efficiency, for example. Finally, why isn't Apple spreading the Mac brand around on Home Servers, Media TV-puters, carputers, stylus driven 2-in-1 convertible notebooks or desktop studio drawing desks? Easy: that would be dumb and a waste of money, as Microsoft has demonstrated over the past two decades. Of course, beyond historical trends and today's market reality, there are some potential factors that could shake up the future of conventional desktop computing. Apple could develop new technologies--both in software and in silicon--that help make Macs far more attractive over Windows PCs than they currently are. One potential factor, mentioned above, is the ability to run more critical software exclusively on Macs. That could involve pulling popular apps from Windows, or Apple investing in the development of more new, exclusive Mac apps, either on its own or in partnership with firms like IBM and Deloitte. Another way Apple could greatly enhance the value of its Macs is to enable users to host existing iOS apps on the Mac desktop. This would eliminate some of the work for developers to bring iOS apps to macOS, while making it possible for companies to standardize on iOS for custom development while still being able to access those apps on Mac hardware for users who need or prefer a conventional PC. Another factor that could make future Macs more price competitive would be to introduce new ARM-based Macs. This could enable lightweight MacBooks to shave their CPU and GPU costs while boosting their RAM and storage, making them more attractive as PC replacements at a price closer to $800. There are also good reasons Apple may not move Macs to ARM. Continuing to enhance Continuity features will also help to stitch Macs closer to the iOS ecosystem, making it harder for PC users with iPhones to want to stay in the Windows camp. Tight integration with new devices like Apple Watch and AirPods also makes Macs an attractive option to PC users who get a taste of iOS. The application of novel Mac features such as Touch Bar and Touch ID could also help enhance the differentiation between Macs and basic Windows PCs, making it easier and faster to do certain tasks. It's noteworthy, however, that all of these ideas for making Macs more competitive have originated in iOS. All the investments Apple has been making in mobile devices has spilled over to the Mac side, in software, in hardware, in cloud services and integration. That suggests that Apple's best strategy for enhancing the Mac is to simply let it continue to follow iOS and improve in tandem. So far, that strategy has moved Apple over the past decade from $19 billion to $215 billion in revenues and from $2 billion to $46 billion in operating income. That's also given Apple a huge war chest for investment. Apple has enough money to make a really fast desktop Mac Pro even if it doesn't sell in significant quantities. It did this in 2013. But without making a material change in the world, such a vanity project doesn't seem capable of much longevity.